Gum disease is one of the most common problems associated with the mouth and oral health. It is so common in fact that most adults in the UK have the condition to some degree and will experience it at least once in their lifetime. There are numerous signs which indicate that you have gum disease. You may find that your gums bleed when you brush your teeth, or you may also have bad breath. These symptoms are an early sign of gum disease, which is often called gingivitis. If left untreated this can then lead to other conditions, such as periodontitis, which can damage the bone in your jaw. 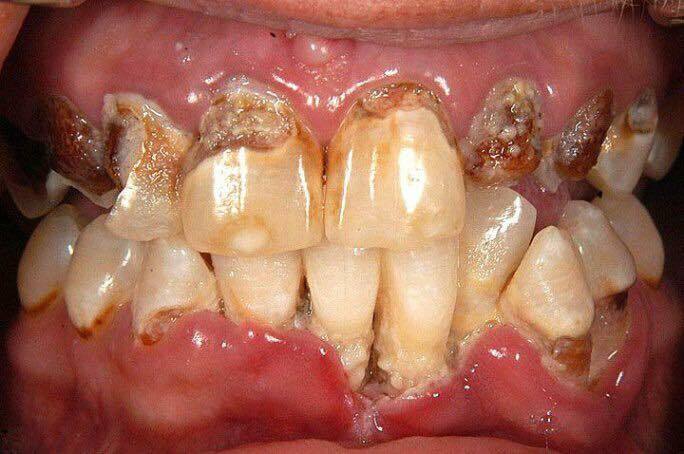 This can not only cause spaces between your teeth and the gums, it can cause tooth loss too. Generally, gum disease is caused by a build-up of plaque on the teeth. This plaque contains certain bacteria which are harmful to teeth and gums. Brushing your teeth is a very effective way of removing this plaque, but if you don’t you risk plaque build-up, which can irritate the gums. As always you should visit your dentist on a regular basis for check-ups of your oral health. However, if your gums are swollen, painful or bleed when you brush your teeth then we’d suggest you book an appointment with your dentist to get your mouth checked. A dental examination will reveal the cause of your dental issue and your dentist will be able to advise on the next steps to get your mouth healthy and happy again. This examination may involve x-rays to check the condition of your teeth and the jaw bone. There are ways to treat gum disease, particularly mild cases where the patient can treat the condition by maintaining a good level of oral hygiene. This can be done by simply brushing your teeth twice a day and flossing on a regular basis. Doing this, combined with regular check-ups at the dentist should help to treat the issue. Your dentist, or dental hygienist, can also help. Having a thorough clean done by one of these practitioners will remove any hardened plaque on the teeth, and give you advice on how to maintain your dental health. In severe cases, you will need to have further dental treatment, which could include surgery by an expert in that area. If you are experiencing any of the symptoms highlighted here, believe you have gum disease, or simply have a question for one of our dentists then please do not hesitate to get in touch with our friendly and professional team at Camden Place Dental Practice, Preston. You can book your FREE consultation with our dentists by contacting us or calling 01772 556 050.